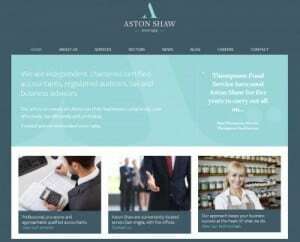 Aston Shaw is delighted to announce the launch of their new website (www.astonshaw.co.uk) following their high profile merger with a fast-growing local accountancy firm and recent group rebrand. The Independent Chartered Certified Accountants with 5 office locations in East Anglia have invested in the development of a brand new, information-driven website that provides their existing and potential clients all the tools and information they may need to make an informed service decision. Constructed with the end user firmly in mind, the website takes a fresh approach, boasting clean lines and adaptive content layout, which optimises to whichever type of device an individual may be using – whether it be a desktop, tablet or mobile – providing an overall engaging browsing experience. The primary goal of the site is to allow users to quickly navigate and find the service or contact information they need with absolute ease. With a comprehensive offering of 23 accounting, financial and business services, each service page has been equipped with an A-Z list which allows the user to quickly and simply move around the site and find the information relevant to them. Dominic Shaw, Director, commented: “We are extremely excited to launch our new website, which we hope users will find to be more accessible than ever before. Along with our innovative new, free to download Aston Shaw App, we hope the website will help and guide both clients and potential clients into making informed service decisions”. A key focus on information sharing and recommendation is evident throughout both the structure and content of the site. Elements such as the industry blog, internal news articles, client testimonial page and links to Facebook, Twitter, LinkedIn and Google Plus all encourage users to engage and further provides an insight into the capabilities and personality of the firm.